If you need to submit your business idea to a super busy senior level executive or even a CEO you need to ensure that its short, sweet and doesn’t take up his precious time. 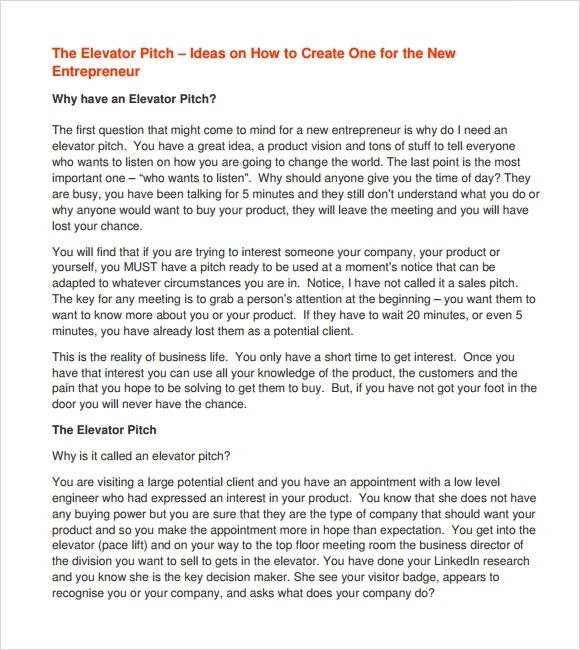 Our Elevator Pitch Templates are ideal for this purpose. Available in Word and Excel formats these templates are absolutely free of cost. 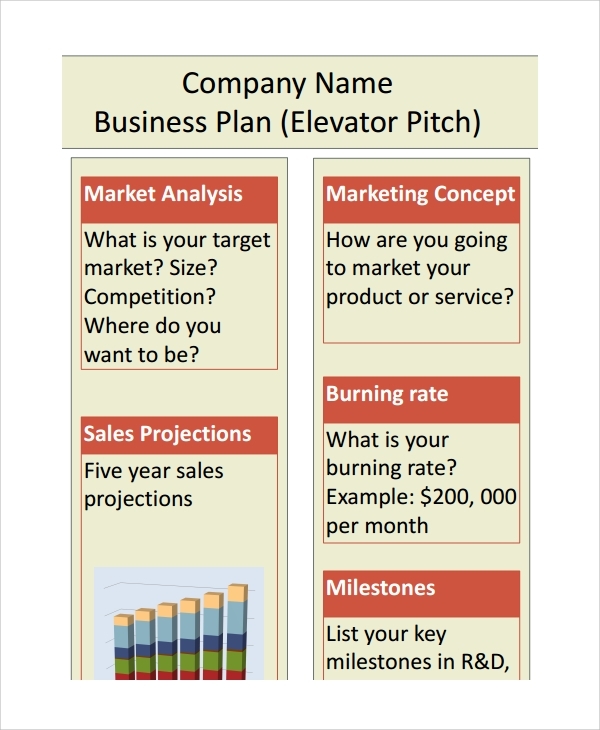 The elevator pitch example templates contain information regarding what the business will do for customers, the profits it will bring to investors, description of the product and services that the business will provide and lots of other relevant data. Select the template of your choice from our extensive range, download it and print it out. 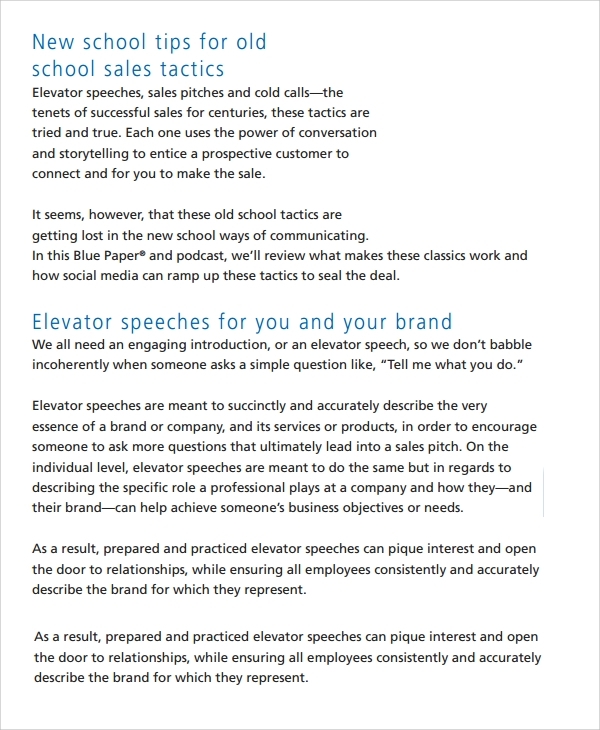 The Startup Elevator Pitch Template is one of the most common templates that startup firm uses to create a detailed sales, business, or corporate info sharing pitch. All of these templates can be customized to help your business grow, discover new heights, and unveil the biggest opportunities. 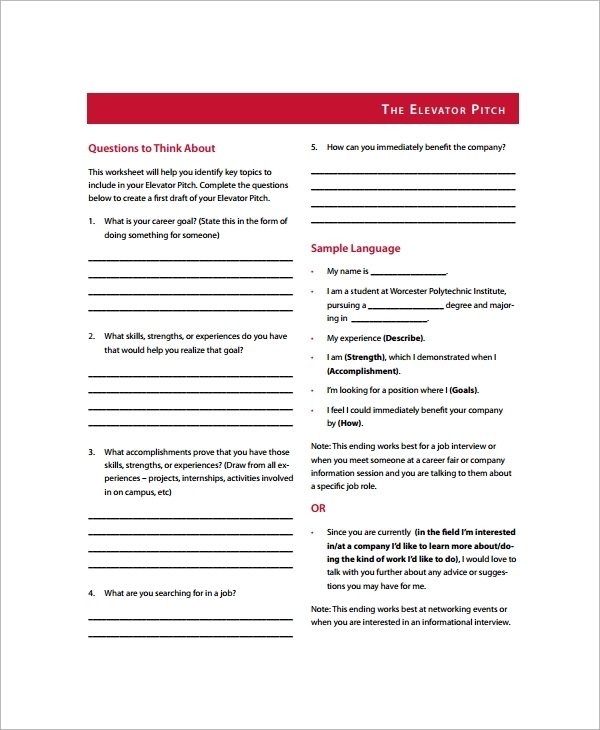 The Business Elevator Pitch Template enables you to create a detailed pitch that can help your business grow and flourish with a passage of time. You can download and use these templates to create a detailed pitch that can help you get a guarantor for funding to start a new business. 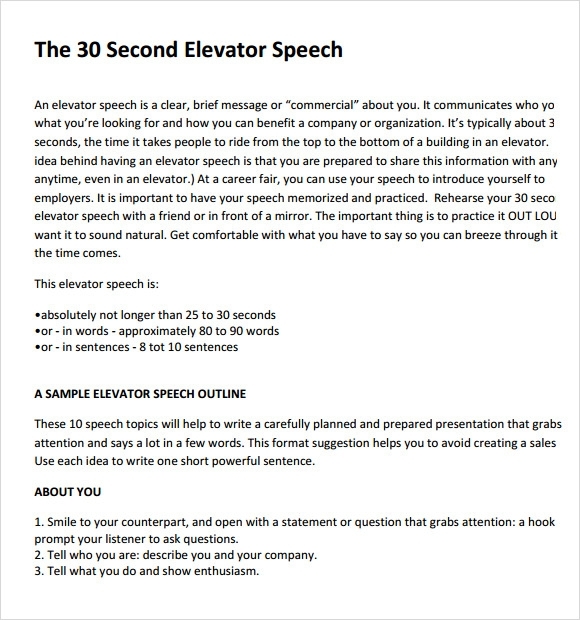 The 30 Second Elevator Pitch Example Template is specially designed and developed by industrial professional to help you convey your ideas, thoughts, and statements in 30 seconds. The template can be used across various industries to make strong statements in discussions without taking much time. The Elevator Pitch for Management Consultant Template can easily assist consultants in quickly understanding one’s frustrations, aspirations, goals and needs to ensure that the employees and co-workers remain energetic and work hard to achieve the common goals. The Elevator Speech for a Business Lawyer Template helps business lawyers to help an organization deliver statements in the industry that are real, legal, and do not have any loopholes to get trapped in uncertain enquiries. 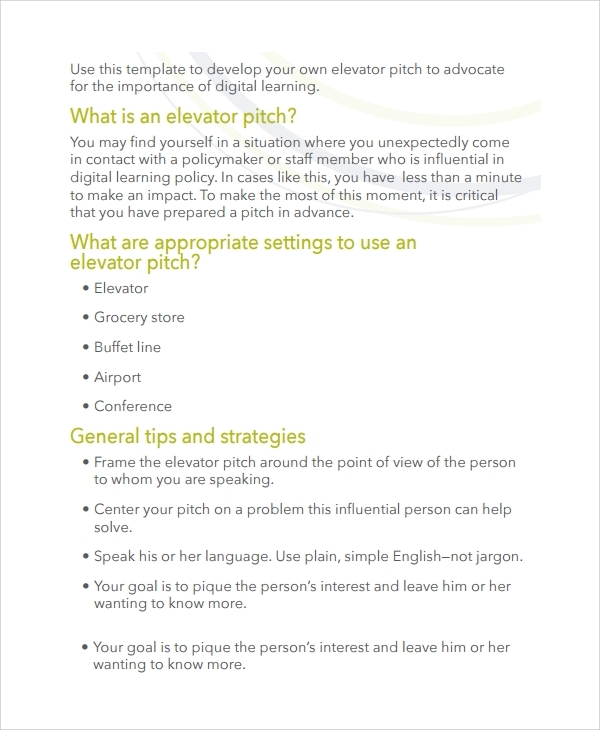 The Personal Elevator Pitch Example Template can be used for personal branding purposes. 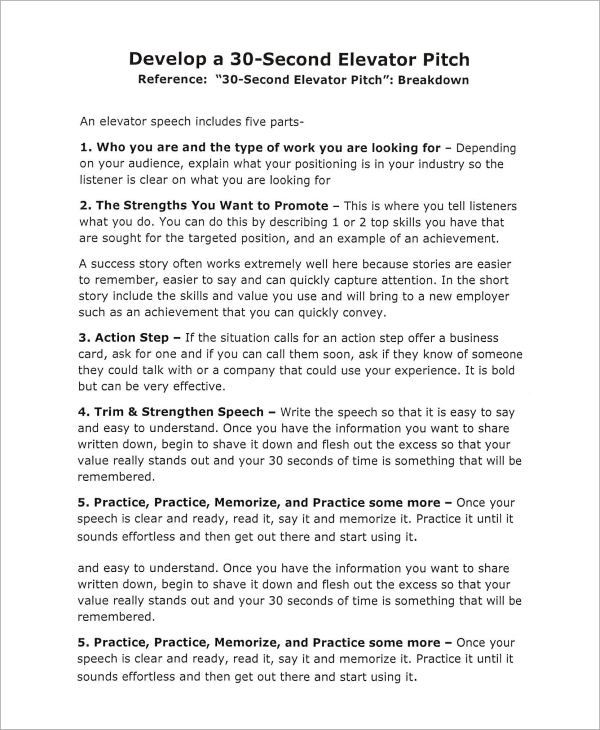 These templates can help you create, draft, print, and deliver a crisp and concise speech that can help you define your forte, experiences, educational achievements, and professional career. 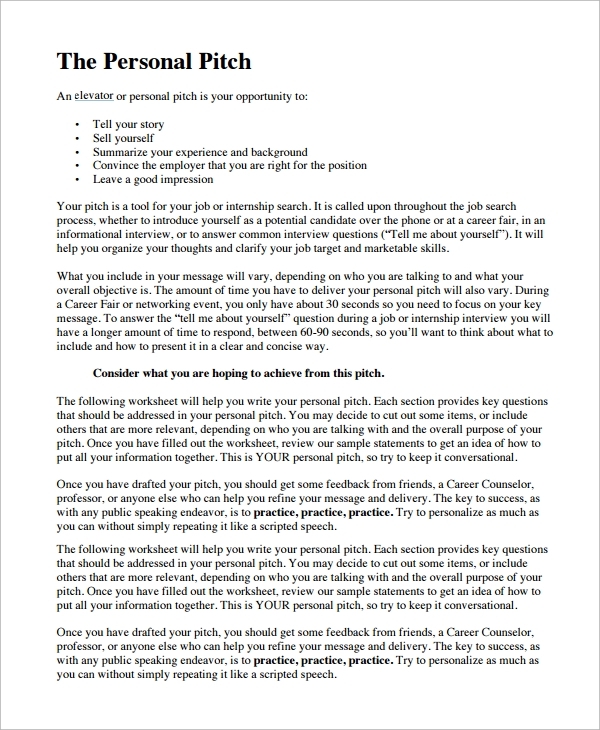 The Elevator Pitch Example for Students Template can be of high use for higher school and college students to help them prepare for their viva examinations. You can easily use these templates to stay prepared for campus placement interviews, science project meets, and others. The Elevator Pitch for Entrepreneur Template works as an important tool of your business’s personal brand toolkit. 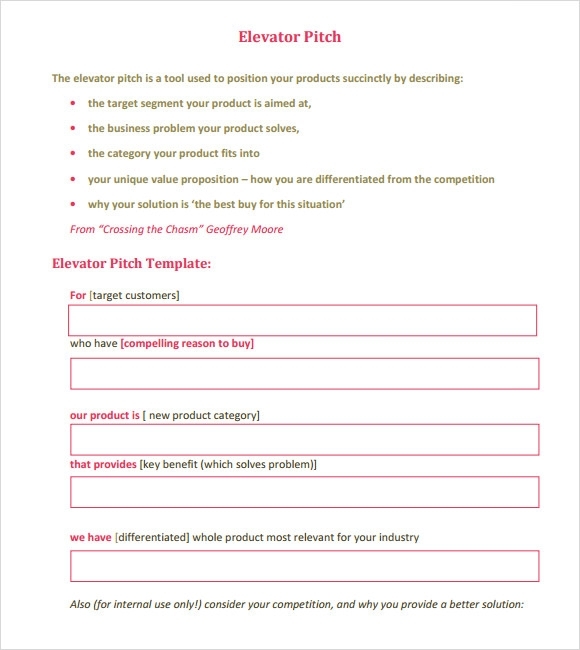 The templates come with pre-set headers for putting relevant data for creating a detailed entrepreneur sales, business, or even press conference pitch. Download and customize these templates to make strong arguments that can help your business grow to new heights. One of the quickest solutions to make these templates work for your desired motive is by filling in the accurate, exact, and meaningful data. 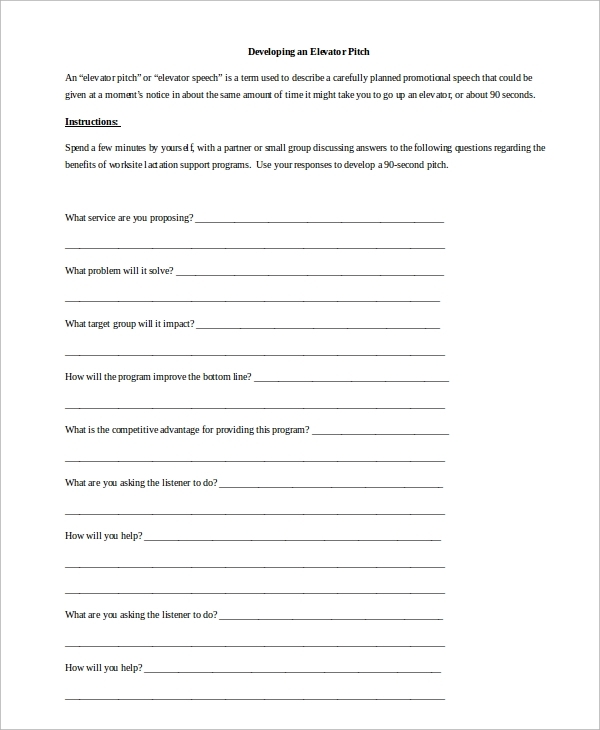 Using these templates can help you save a lot of time, money, and effort that goes in while preparing detailed speeches, pitches, and discussion notes to help you portray your ideas clearly. All of these templates can be easily customized and modified to meet your desired purposes at large. Since delivering a pitch in front of others require a lot of confidence and accuracy in data or figures used, all of these templates can help you create detailed pitches without taking much time. Working as a cost and time save alternative, all you need to do is to fill in the required data. You may also like Welcome Speech Examples. The readymade templates available under this category enable a user to generate a printed copy of your sales, business, or student pitch within a few minutes. Coming with a pre-set format and headers, these templates can be used for creating and publishing professional pitches without making much effort. Download and use these templates for creating detailed, short, or medium sized pitches to impress your friends, colleagues, and co-workers. All of these templates come with high customization and editing options to make you create strong, impressive, and explanatory pitches with ease. 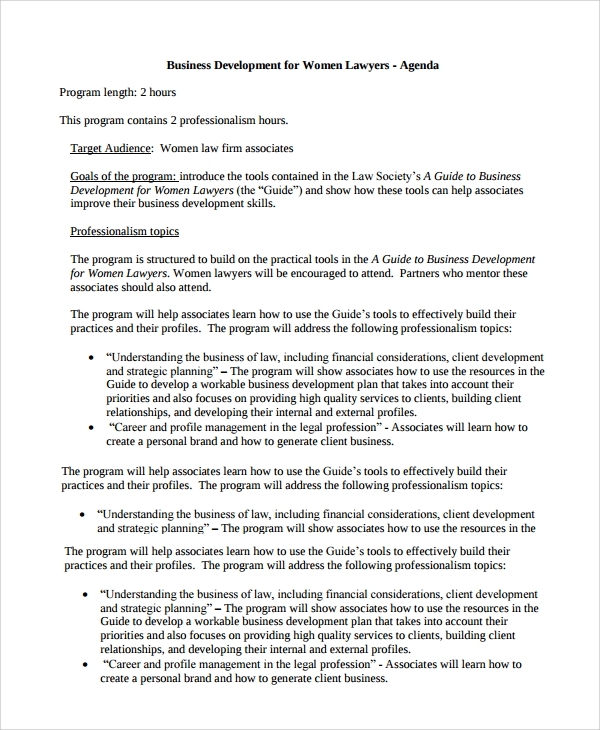 Since these templates can be printed and shared easily, you can create a detailed pitch and circulate it amongst your colleagues, business leaders, legal advisors, and other such professionals to take their valuable feedbacks, before delivering the actual statements.